Luz-Saint-Sauveur is a cute tourist town sitting at the crossroads for many good Pyreneean climbs. Immediately out of the town are the climbs of Col du Tourmalet and Luz Ardiden, both regularly used in the Tour de France. Heading south from town are climbs to the Col de Tentes/Port de Boucharo and the Cirque de Troumouse. About 15 km north of Luz, near Argelès-Gazost are the climbs of Hautacam, Cauteret/Pont d’Espagne, and Col de Soulor. It’s well worth spending some time in this area. We were not here for long enough and we had very mixed weather: a perfect sunshine day, rainy days, and overcast days. 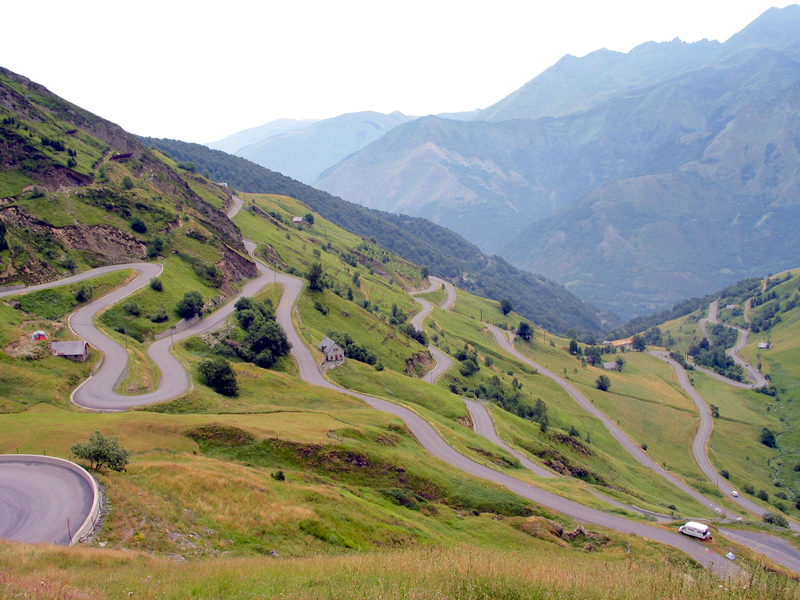 This is the big climb of the Pyrénées, one of the most famous climbs in the Tour de France. It’s a fantastic climb from both sides, but if you can only do one side, I think the west side from Luz-Saint-Sauveur is the better. If you can do both sides you get a wonderful day out with 71 km and 2,640 meters (8,661’) of climbing. There are kilometer markers on both sides telling you how far to the top and the average gradient of the next kilometer. From Luz-Saint-Sauveur, on the west side, it’s 18.6 km to the top, with 1,365 meters (4,478’) of climbing. Head up the valley, riding through the cute little town of Barèges. The road is mostly straight up the valley until KmM 5. The climb is never too steep, and there’s only section that is signed as being 10% – the last kilometer. Just before KmM 9 you see a blocked-off road to the right with a sign showing it is the Voie Laurent Fignon. 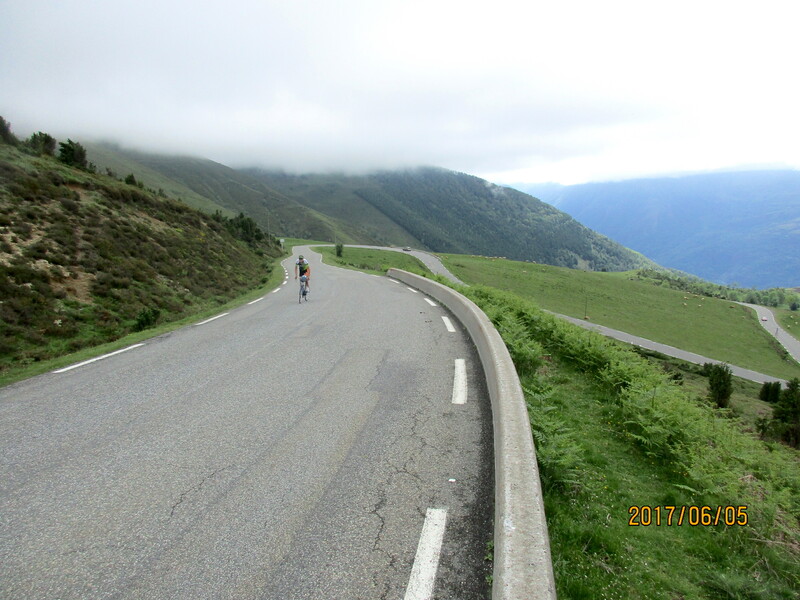 When I rode the Tourmalet in 2008, this was the main road, but is now an uphill-only road for cyclists. However most cyclists stick to the main road with its kilometer markers. At about KmM 7 you see the end of the valley and start to wonder if the road goes up the very steep looking tracks. The answer is no, it does two huge switchbacks up the green slope on the left of the chairlift. Just after KmM 5 at the Tourmalet chairlift the road turns right and you enter the switchback section and the ride gets really fun. When you are on the two huge switchbacks you get spectacular views looking back down the valley. Finally you get to the last kilometer and then the last cut back left to the top, which is the steepest part of the whole climb. 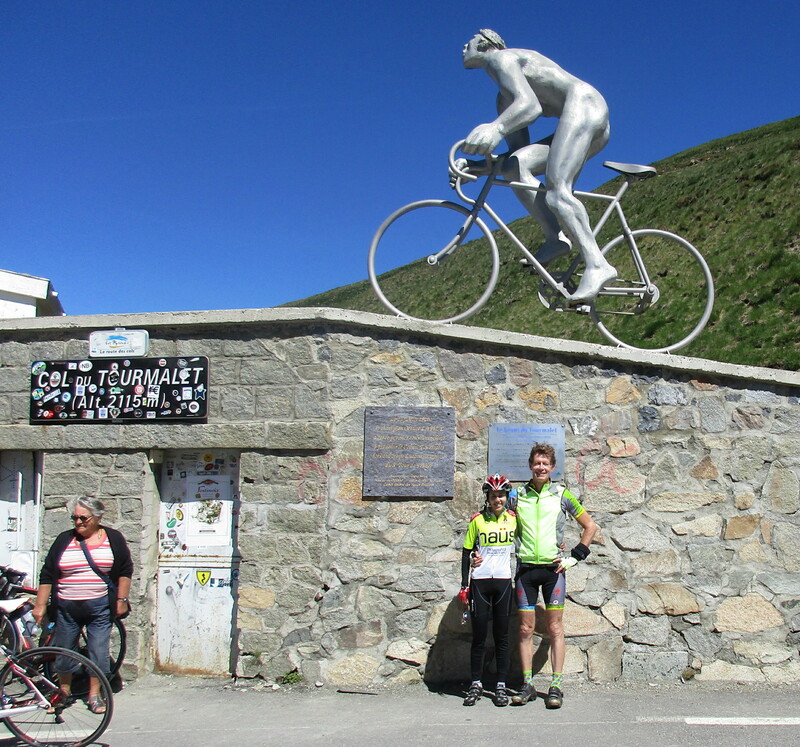 Once on top you have the obligatory photo in front of the statue of the Géant du Tourmalet. After you leave the trees, for about a kilometer, starting just before KmM 6 and finishing just before KmM 5, you go through four open-sided tunnels that prevent snow avalanches on the road. Shortly after the tunnels you enter the bleak, ugly ski town of La Mongie. After leaving this you have about 4 km until you reach the top. This is the best part of the ride from this side, with good views of the ski bowls. At the top you once again see the large Géant du Tourmalet statue. 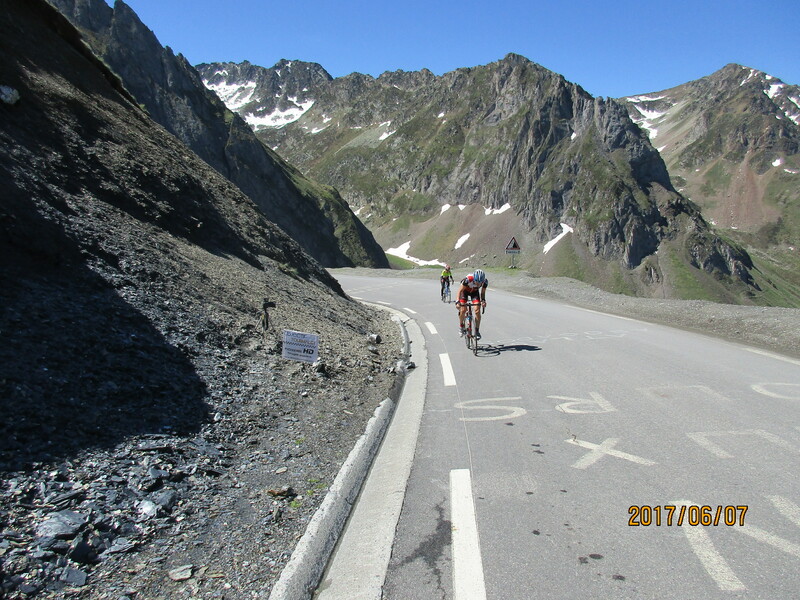 Luz Ardiden is a climb to a ski area that has been used in the Tour de France after the riders come over the Col du Tourmalet. It starts off feeling quite residential but soon gets a very pastoral feeling. As you reach the last few kilometers you can look up and see the switchbacks high above, then up above you get wonderful views of the switchbacks below. From the center of Luz-Saint-Saveur the ride is 14.3 km with 1,036 meters (3,399’) of climbing. Take the D921 signed to Luz Ardiden. After about 1 km at the roundabout turn left then at km 1.3 at the roundabout turn right, again following signs for Luz Ardiden. You now see your first cycling kilometer marker, telling you it’s 13 km to the top. Near the top the road splits and you take the left hand road. The climb starts basically in Argeles-Gazost. Follow the D100 towards Luz-Saint-Saveur and after crossing the bridge the D-100 turns left up the hill. If you are driving, you can park on the right at this intersection. If you are coming from Luz-Saint-Saveur on the D913, the Hautacam turns right at KmM 0. Again you can park on the left at this intersection. From this intersection the climb is 14.5 km with 1,103 meters (3,619’) of climbing. Just before 1 km turn left then just after 1 km turn right, following signs for Hautacam. At 1.25 km you see your first cycling kilometer marker, telling you that it’s 13 km to the top. Extra credit: At the very top, just before you descend slightly to the buildings, turn left and climb up the switchbacks to the Col de Tramassel. This adds 1.3 km and 107 meters of climbing.